Another factor to consider is the quality of the floats you are choosing. There many cheap floats around, produced in places like China using low-cost materials. But if you want reliability, consistency and quality assurance, you need to make sure that you choose UK-made floats with high-class materials and parts. With all of this in mind, just how do you choose the right pellet waggler float for your fishing? Some wagglers have large-diameter parts on the base or tip. Such a feature is to deliberately act as a 'brake', reducing how far the waggler float dives in the water. Some, such as the Middy Pellet Poppers, will also make a 'pop' sound on hitting the water, imitating the sound of an 8mm pellet hitting the lake. The large diameter also helps the self-hooking effect. 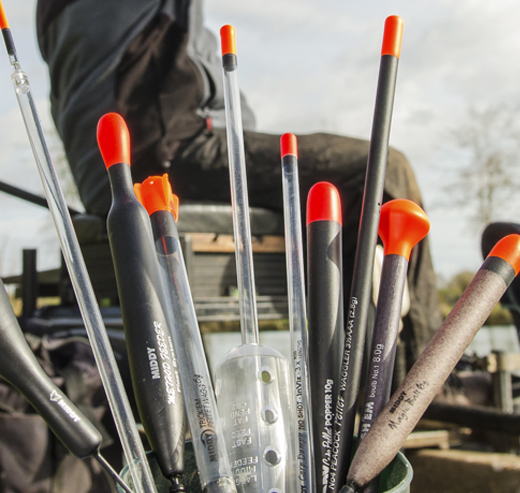 These floats tend to be loaded and heavy - perfect for large waters. Traditional wagglers such as this are best for fishing deeper; for example 5ft to 8ft deep, either on or off the bottom. They are more sensitive so they're good for spotting any bites which occur on the drop, as the shot registers. Small bulky floats can get carried by the wind, but these stay in place better. Give the Middy Fat Boy floats a try. One of the best materials used in pellet wagglers, 'styrex' or 'styrofoam' floats are extra buoyant and quite thick. This means you can fish floats like this about a foot or so deep, because they don't dive very far at all. Your rig is ready for a bite instantly and these Middy Magic-Ball floats (pictured above) come with an optional loading too. A genius concept, nominated for 'Innovation of the Year'. The Trick 'Em contains a number of shot inside its body. The purpose of these is to make a micro-feeder-pellet-like sound on entry, tricking fish into thinking that food has entered the water. A lot of pellet wagglers have flights on the tips or bodies, like this one. These help make the float aerodynamic when you cast it out. Another float with a brake attached, this time with ribs to give it an anti-dive design. Middy Parachute wagglers are loaded and don't require shot to lock them in position, so you can use a lighter mainline than you would with an unloaded waggler float (for example 4.4lb or 5.2lb). On some fisheries, such as those with a low stock of larger carp, fish have wised up and won't tolerate a large pellet waggler landing. Instead, try a smaller, clear waggler - the Middy Splash 'Em range fits the bill perfectly. These are also a good choice for casting at fish you can see cruising about near the surface. These floats take a lot of weight and make a lot of noise when they land. They are perfect for fishing in the top few feet of the water, especially on the far bank, in conjunction with 8mm pellets or even feeding balls of groundbait. The natural white-woodgrain finish on White Knuckle carp-lake waggler floats can actually attract fish to the swim! Some floats have a huge elongated top, such as the Middy Splasm 'Em boulb model. This large 'mushroom' shape helps fish to hook themselves, reduces how far it dives underwater and also acts as a large bright target for firing pellets or groundbait at. Some large floats combine the effectiveness of both float and feeder, via a Method frame which is attached to the base. Wrap a cloudy groundbait around this and cast out using a rod of around 1.5lb test curve. You need strong lines and hooklengths, as takes are savage! For the hookbait, a boilie is very good on a short hooklength. This is a very specialised approach which is only allowed on certain venues. It tends to work best on large reservoirs such as Drayton, where carp are feeding off the bottom at distance. Never ever let go of your rod while using this technique! Probably the design for this type of float is the Baggin' Machine. Give them a go. Unloaded wagglers require between two and six SSG shot to lock in place on the line. This can damage the line, so attach them very carefully and use a good quality shot like the Middy Twin-Cut. You can put a length of thin silicone on the line, threading through the eye of the float or the silicone waggler attachment used. This helps to cushion the pressure of the shot, minimalising any damage caused to it. A Middy pellet float adaptor is a must-have for loaded wagglers and they remove the need for any shot. T-Bar attachments like this are fitted to the line with silicone, or in this case fibre-stem pegs. The fibre-stem grips better to stop the float from slipping and the fibre material protects line better than metal does. Simply clip the loaded float into the swivel and you're ready to go!